Thought that you guys might be interested in the results of the vodka tasting that I held this past weekend (here). We did a blind tasting of 5 vodkas at room temperature. My top choice was Grey Goose. I'm a little disappointed in myself. Makes me feel so mainstream. I usually drink Chopin or Ketel one. But maybe I guess this means I should switch to Goose. Oh and if you're curious, this is how "scientific" one of the participants was with her tasting. Yes, your eyes do not deceive you - vodka #5 got a one-eyed smiley face which turned out to be 2nd place. 3 Response to "Vodka Tasting Results"
haha love that smirnoff got no votes...that's what my friends and i always drink on a budget. 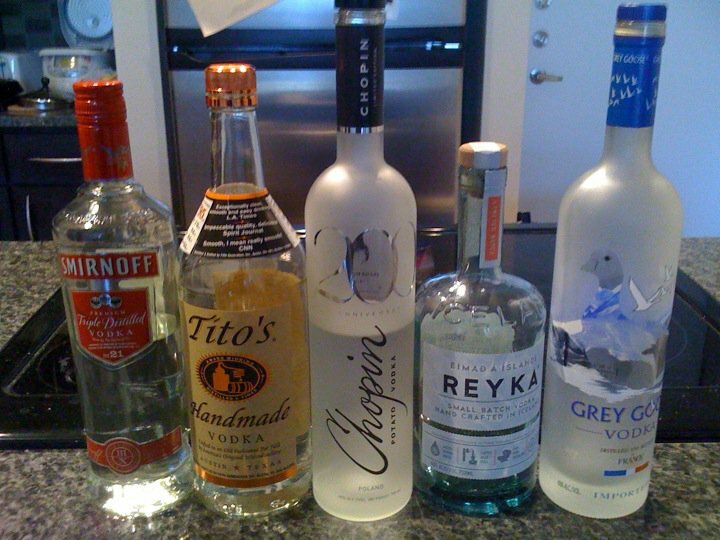 I agree that Grey Goose is prob my fave. i will have to try the Reyka. I can't believe Titos didn't do better! I'd still try Titos if you're not familiar, especially if you travel to Austin! (Austin + Titos + Sweetleaf Tea = Packaged happiness).